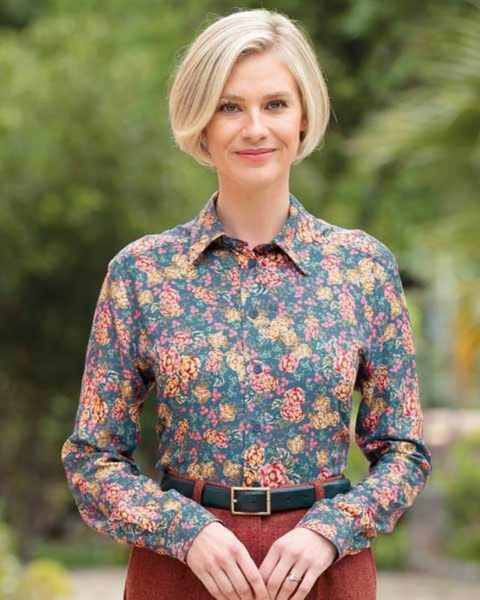 Ladies Floral Blouse in supersoft viscose with exceptional drape. Ladies long sleeve style blouse with traditional collar and back yoke. Straight hem with side vents, which can be easily worn outside or tucked in. Cut from supersoft viscose with exceptional drape. Attractive floral design with highlights of rosehip, mimosa and toffee on a blue base. Coordinate with any of our collection of skirts and trouser to achieve a stylish look.